Interesting combinations of words, huh? One sounds positive (Progress) and the other sounds, well…fearful (Fear)! Actually the title is about two positive things! 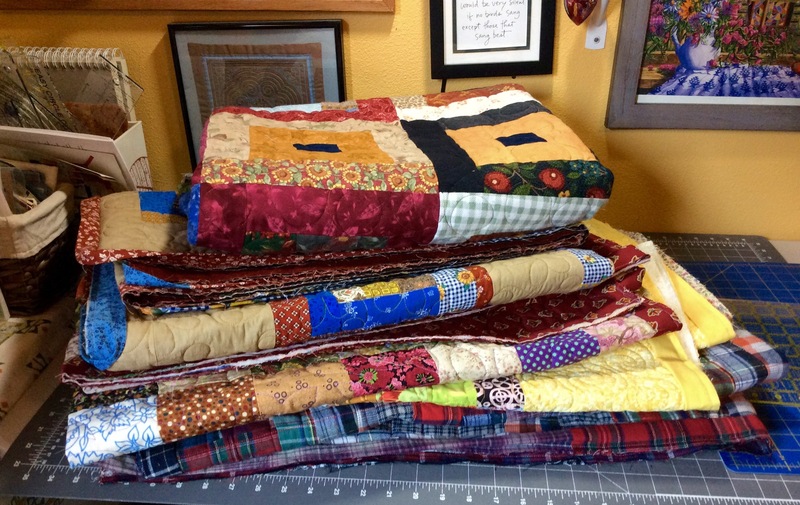 Making progress on the five (5) quilts that are back from the long-arm quilter and need bindings to be completed (refer to the posts “Some Progress Made” and “The Quilting Husband Saga Continues” for more info). Terry the Quilting Husband assembled the bindings and I have sewn them onto all 5 quilts. Now they are waiting in a nice pile to taken turns sitting on my lap and have their binding sewn down. Then they will be complete! Fear will never go away as long as you continue to grow (this is a good thing)! The only way to get rid of the fear of doing something is to go out and do it! The only way to feel better about yourself it to go out and do it! Pushing through the fear is less frightening than living with the bigger underlying fear that comes from a feeling of helplessness!